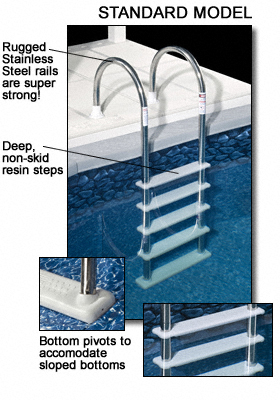 This super strong ladder brings the quality and strength of an inground ladder to your aboveground pool! 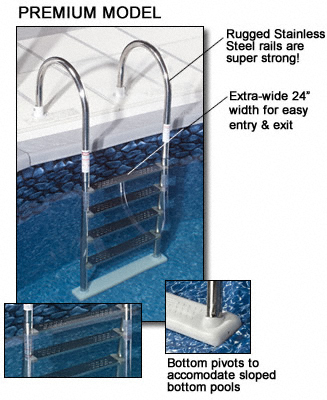 This top quality in-pool ladder makes exiting and entering you pool easier than ever before. 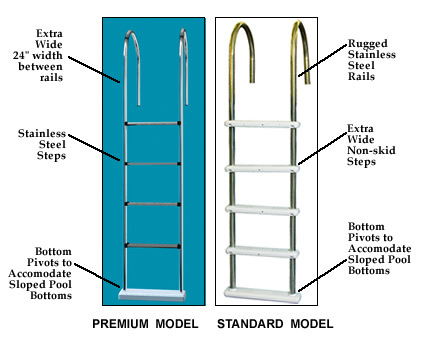 Super-strong stainless steel rails allow the ladder to easily accommodate up to 225 lbs. The ladder is designed to fit up to 54” deep pools. The base of the ladder pivots to conform to sloping bottoms for super safe contact. Standard Model has polymer nonskid steps and white plastic flanges. Premium Model has stainless steel steps. Optional 9"x30" Ladder Pad helps protect your pool liner.